Published by:Blue Boat Co., Ltd.
Free Fun Game! Addicting thinking word game! Each level is a fun riddle, can you guess the word? 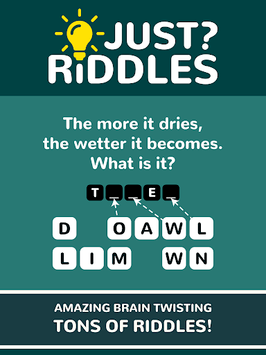 Tons of riddles to boost up your brain power! Some easy, some challenging, some tricky, and some funny! No registration, no complicated rules. Just start playing, guess the word, and have fun! Read the riddle and think; find out what word is the answer. Guess the word. Win! 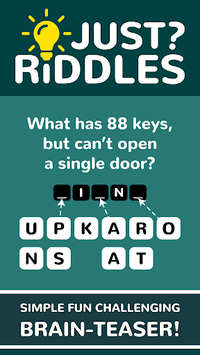 You can play Just Riddles word game offline anywhere anytime. No Internet is required! 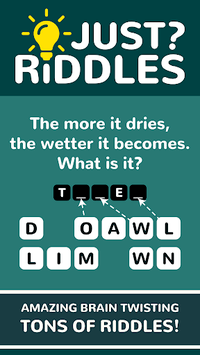 Just Riddles is one of the best word games for kids. Help your kids to think from riddles. Have a great time together with these amazing riddles from Just Riddles! If you are a word game lover, you will find this game to be quick, easy, & a lot of fun! See if you can handle the addictive word challenge Just Riddles!